CHRISTCHURCH, New Zealand — New Zealand's prime minister declared Tuesday she would do everything in her power to denythe accused mosque gunman a platform for elevating his white supremacist views, after the man dismissed his lawyer and opted to represent himself at his trial in the killings of 50 people. 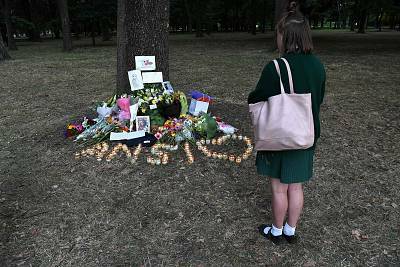 "I agree that it is absolutely something that we need to acknowledge, and do what we can to prevent the notoriety that this individual seeks," Prime Minister Jacinda Ardern told reporters. "He obviously had a range of reasons for committing this atrocious terrorist attack. Lifting his profile was one of them. And that's something that we can absolutely deny him. "Ardern, who also promised to examinethe role social media may have played in the attack, demurred about whether she wanted the trial to occur behind closed doors, saying that was not her decision to make. In a passionate speech to Parliament, she urged the public to follow her lead and to avoid giving the gunman the fame he so obviously craves. "One thing I can assure you — you won't hear me speak his name," she said. "I implore you: Speak the names of those who were lost, rather than the name of the man who took them," she said. "He may have sought notoriety, but we in New Zealand will give him nothing, not even his name. "The shooter's desire for attention was made clear in a manifesto sent to Ardern's office and others before Friday's massacre and by his livestreamed footage of his attack on the Al Noor mosque.The video prompted widespread revulsion and condemnation. Facebook said it removed 1.5 million versions of the video during the first 24 hours, but Ardern expressed frustration that the footage remained online, four days later. A judge ordered Tarrant to return to New Zealand's High Court on April 5 for his next hearing on one count of murder, though he is expected to face additional charges. The 28-year-old Australian is being held in isolation in a Christchurch jail. "He seemed quite clear and lucid, whereas this may seem like very irrational behavior," Peters told the newspaper. "He didn't appear to me to be facing any challenges or mental impairment, other than holding fairly extreme views. "Ardern previously has said her Cabinet had agreed in principle on tightening gun restrictions in New Zealandand those reforms would be announced next week. She also had announced an inquiry into the intelligence and security services' failures to detect the risk from the attacker or his plans. There have been concerns intelligence agencies were overly focused on the Muslim community in detecting and preventing security risks.New Zealand's international spy agency, the Government Communications Security Bureau, confirmed it had not received any relevant information or intelligence ahead of the shootings.